Danish brand Jamo has been exciting home cinema senses for years with killer audio kit that won't break the bank. A case in point is the £260 S426 HCS3, a system that features a pair of 910mm-high S426 floorstanding speakers at the front, which isn't something you'd expect for this price. They're joined by a pair of bookshelf surround channels (S420 SUR) and a centre speaker (S420 CEN). Jamo has compromised on the floorstanders' build quality. They're lighter than you'd expect and there's a hollow sound when you tap 'em, none of which screams 'audiophile'. Jamo's designers cleverly divert attention from this with a dashing design – industrial grey panels below the removable grilles are set into a tasteful black ash finish (also in White Ash and Wenge). Both the centre and surrounds are exclusive to this system and can be easily wall-mounted thanks to keyholes on the back. Build quality is solid, although springclips on the back of the S420 SURs are a slight disappointment considering the rest of the speakers sport binding posts. It may be an optional extra, but the SUB260 subwoofer fits in aesthetically with the other cabinets. And while its design could cause a problem if you're pushed for space, it does allow plenty of internal volume. On the inside are the titular 260W amplifier and an 8-inch woofer; the back panel offers dials governing level, crossover frequency and phase. Frequency-wise, the SUB260 patrols the 30-200Hz territory. Meanwhile the S426's two-way bass-reflex enclosure houses dual 5.5-inch woofers and a 1-inch low-resonance Waveguide tweeter. The surrounds and centre are also two-way, but use smaller drivers. Despite its budget nature, the S426 HCS3 is no shrinking violet. It's thunderously powerful, not only thanks to the Herculean subwoofer but also to the natural drive of the floorstanders. They're authoritative and dynamic, lending depth and weight to the meaty bits in any blockbuster flick. But the SUB260 is the real muscle, needing little prompting to unleash its thick, thumping bass upon you and your neighbours. It may take a bit of dial-tweaking to lock it all down but the results can be superb – it's taut, controlled and joins seamlessly with the other speakers. In fact, the entire system displays levels of teamwork and interaction the Harlem Globetrotters would be proud of, with a tight, coherent sound glued together by the SUB260's fluid bass notes. As you move up through the frequency range, it masterfully articulates speech, while high-frequency reproduction is terrific, making DTS HD Master Audio material sparkle without sounding too harsh. This boisterous sound is instantly gratifying and designed for maximum impact, yet sometimes it comes at the expense of poise and insightful detail retrieval. But when it's this much fun to listen to, who cares? 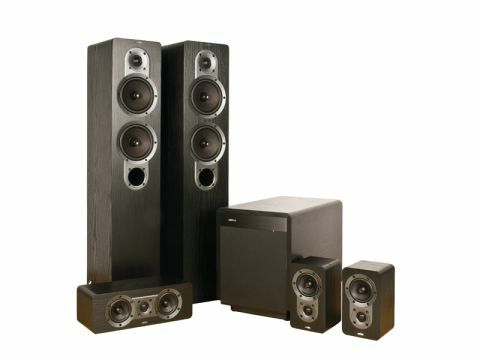 You're getting a powerful 5.1 system with floorstanding speakers for the same sort of money you'd expect to pay for a good set of compacts. It's not the finest array Jamo has ever produced, but if you're looking for bang for your buck then this Great Dane is certainly worth a punt.